Rumours persist that M-Tec, the company now responsible for the Mugen brand, is considering a serious assault on the sportscar racing scene. Sources have suggested that the company's four litre, V8 engines are not only likely to be seen aboard LMP1s in Europe during the 2006 season, but that M-Tec is interested in a project of some description in its home market too. Throughout the close season there have been rumours of a link between Courage and Mugen and an update on the build programme at Courage - here - has already suggested that a new LC70 is bound for Japan. Could these two strands be combining to form a potent new contender? With the Hitotsuyama Zytek already testing ahead of the JLMC season, a brand new Courage Mugen could well give the prospect of a great jump start for the newest addition to the ACO's 'family' of racing. If so, this is exactly the sort of programme which the organisers hoped that the new series would encourage. The 'ArtioteQ Swiss Spirit’ Le Mans project (with a Courage LC70 Judd) is being unveiled at the Geneva Motor Show today. 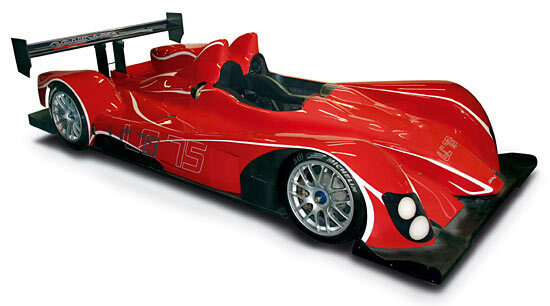 This is (obviously) the LC75 (LMP2) version of the 2006 Courage.